2010 Sea Ray 470 Sundancer The 470 Sundancer comes standard with twin Cummins MerCruiser QSB 425 diesels (425 hp - 313 kW) mated to Zeus drives individually articulating pods that offer up to 15 percent better fuel economy and 15 percent faster top speeds than regular inboards. Plus, the Zeus-equipped 470 Sundancer provides a more comfortable ride because gear noise and vibration are significantly reduced. Optional power includes twin Cummins MerCruiser QSB 480 diesels (474 hp - 353 kW) with Zeus drives. 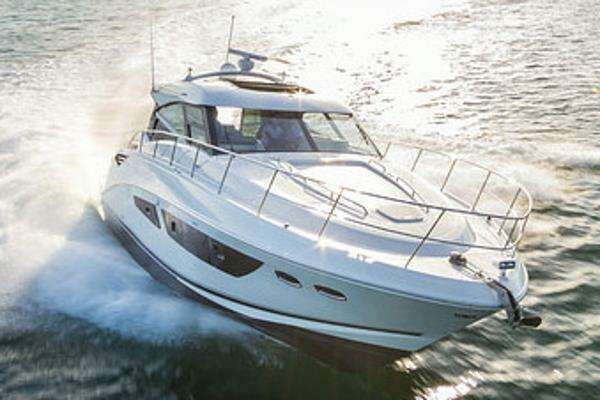 Above the waterline, the 470 Sundancer is everything that discriminating boat owners have come to expect from the definitive express cruiser series on the water. 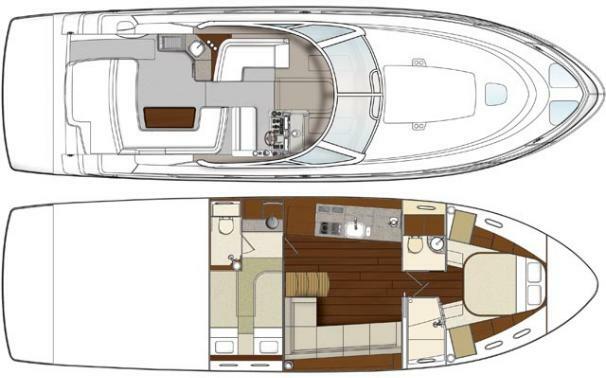 It starts with a trademark reverse sheer line, below which are two oversize hull windows and 10 portlights. A hardtop integrates seamlessly with the windshield for the ultimate in weather protection and climate control (16,000-BTU helm air conditioning/heating is optional), yet you can still let the sun shine in thanks to two retractable skylights. The captain will enjoy that sunny warmth from a double-wide helm seat with flip-up bolster and armrests. It slides and adjusts vertically in front of the gel-coated dash with SmartCraft VesselView Display and MerCruiser digital throttle and shift. To port, guests can lounge on the big L-shaped bench. The seating options continue in the cockpit, which boasts a U-shaped lounge flanking a convenient fiberglass table; a wet bar opposite features a solid-surface countertop, sink and icemaker or you can opt up to the removable flatscreen TV, stainless-steel barbecue grill and refrigerator. 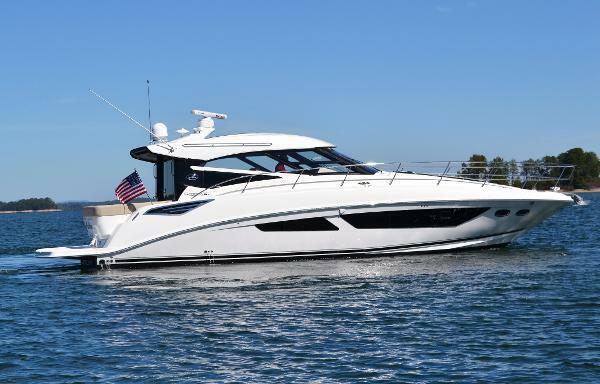 At its heart, the 43 Sundancer is a boat that will make owners feel comfortable in any situation, whether it be driving, docking, entertaining, or cruising with friends and family. And since it comes with a free membership in the Sea Ray Owners Club, which offers great money-saving benefits and endless fun experiences like owners rendezvous and dock parties, the newest sport yacht will have ample opportunity to show off its slick handiwork. 2010 Sea Ray 470 Sundancer 2010 Sea Ray 470 Sundancer powered by twin Cummins 480 Zeus (358 hours) with joystick docking and Skyhook GPS and auto-pilot, SmartCraft color gauge, DTS shifter, Raymarine E120 chartplotter with Radar, Charts, and back-up camera, cockpit refrigerator, cockpit grill, windlass anchor, spotlight, automatic trim-tabs, electronic sunroof, galley features include convection microwave, under-counter refrigerator /freezer, three-burner stove, Cherry wood , salon couch with ceiling mounted flat-screen, forward master with separated shower and head, aft vip with convertible queen to two singles with vip head with separated sink Boat is located in Catawba Island, Ohio. Can be shown by appointment, call today! 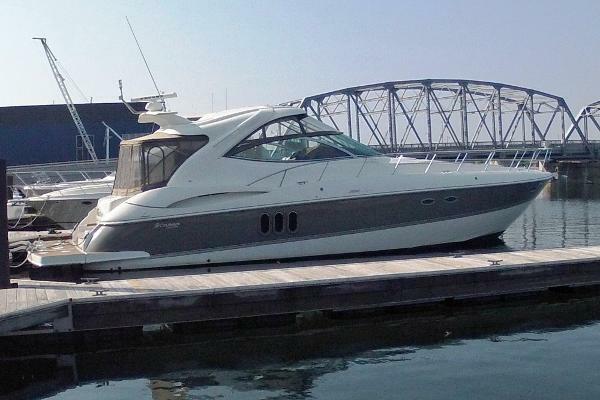 2010 Sea Ray 470 Sundancer Very clean well maintained 470 with Zeus only 120 hours,owner motivated !!! Very well equipped boat with 480 Cummins with Zeus pod drives ,auto trim,skyhook,double e 120 plotters with hd radar ,kvh,hydrolic platform,black hull, a real beauty! 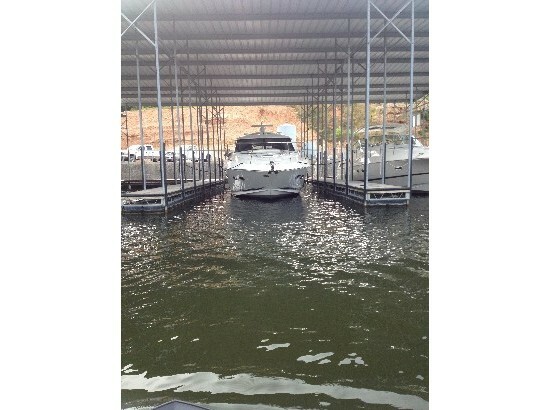 2011 Sea Ray 470 Sundancer Beautiful 470 Sundancer with Zeus and many options. Captain maintained and easy to see 7 days a week in Coconut Grove. Owner wants a center console. 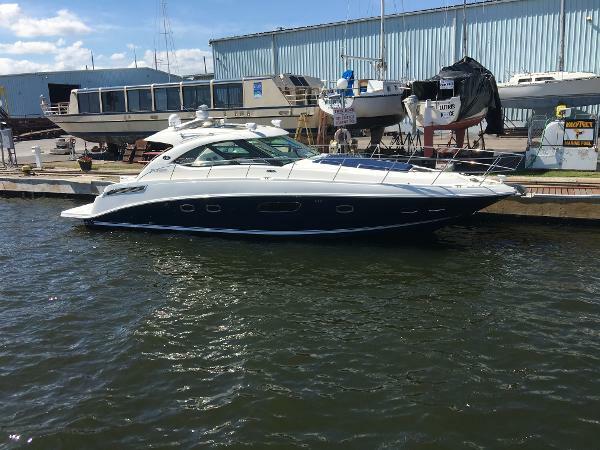 2015 Sea Ray 470 Sundancer 2015 470 Sea Ray Sundancer in LLC transferable no sales tax, with many upgrades, the motors were upgraded to Mercruiser Zeus twin drives with Cummins diesel and joy stick and autopilot 480 HO 459 hp each 918 total hp, top speed 32 to 34 mph, fuel burn is 16.5 gph each motor At cruise speed 23 mph, Black hullside upgrade, cherry high gloss interior wood, central vacuum, sunroof in hard top, under water lights, cockpit electric retractable shade, cockpit electric grill, premium audio upgrade, teak flooring cockpit and swim platform, hydraulic swim platfrom, Raymarine E125W GPS plotter, Radar, fish finder, windlass with all chain and stainless steel anchor, oil changer for motors and generator, Onan diesel generator closed cooled, transferable motor and hull warranty over 3 1/2 years left on factory warranty. Low hours very good condition, must see. Financing available on approved credit with 20 percent down. 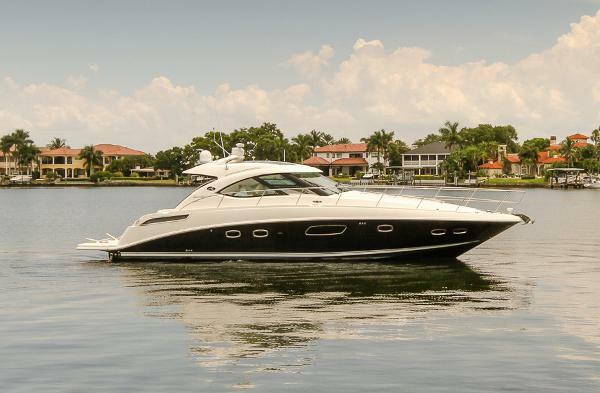 2012 Sea Ray 470 Sundancer The Sea Ray Sundancer 470 is a sport yacht with sleek styling, sumptuous accommodations, and advanced power systems. 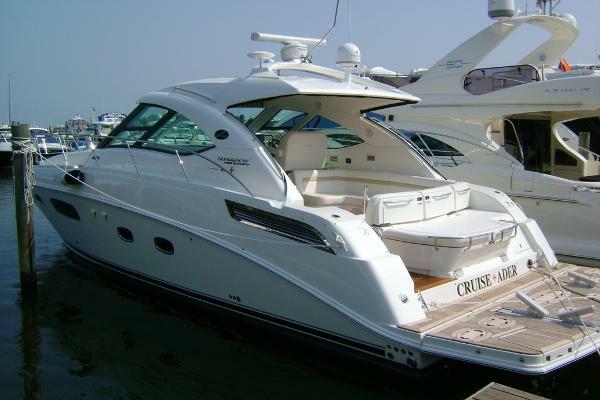 This boat is offered by its original owner and is in excellent condition. 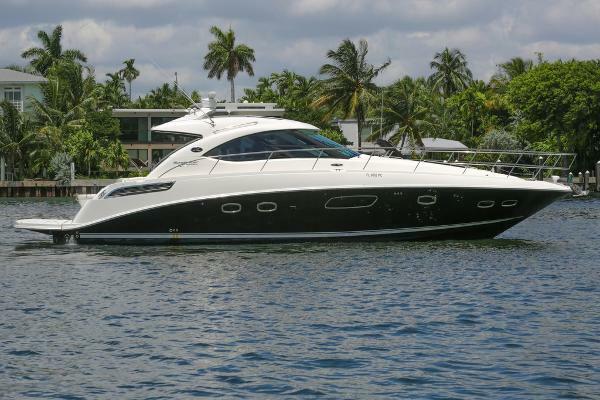 Features include: Twin Cummins QSB diesel 480hp engines Zeus Pod Drives Onan generator Air conditioning Skyhook Precision Pilot Extended swim platform Raymarine E140 radar / plotter Call now to arrange a viewing! 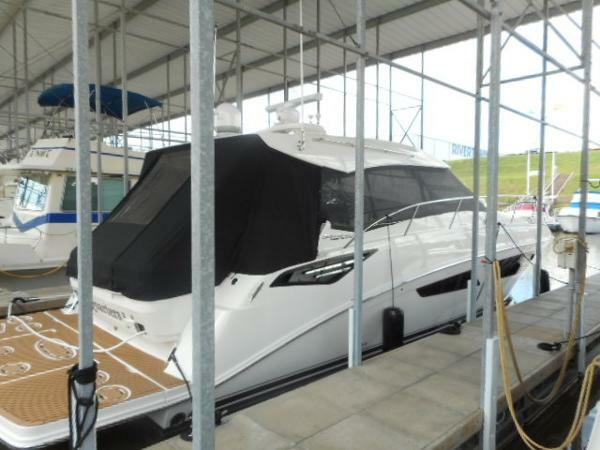 2009 Sea Ray 1 430 / 470 Sundancer 2009 Sea Ray 430/470 SunDancer The 2009 model 430 Dancer is identical to the 2010+ model 470 SunDancer. 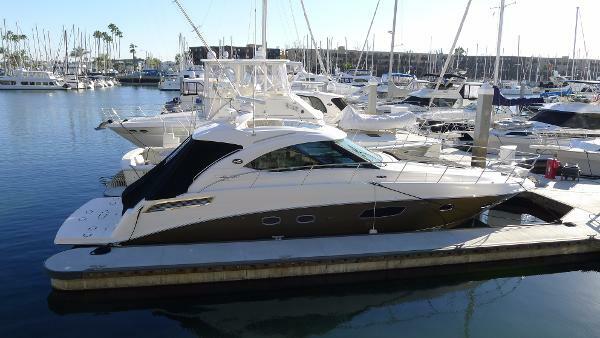 We're proud to be offering this exceptional example of a well kept, and well equipped 430 SunDancer. Sea Ray checked all the right boxes on the build sheet when they made this boat. 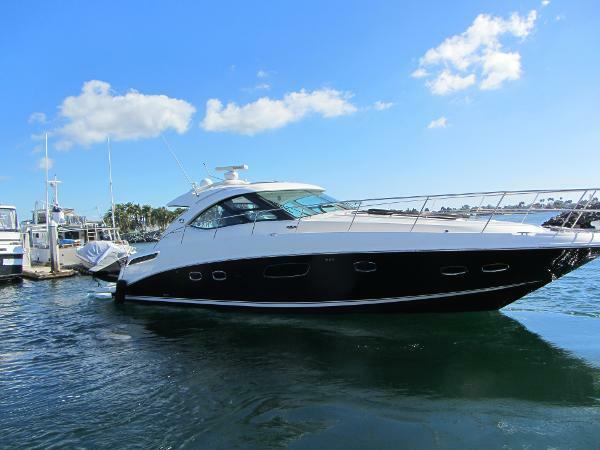 Incredible condition top to bottom, nice upgrades and options, one of the lowest hour boats on the market, and ready to cruise today. Scheduled maintenance done by Cummins here in Tampa, recent bottom job, regularly cleaned and detailed, this boat is really top notch. 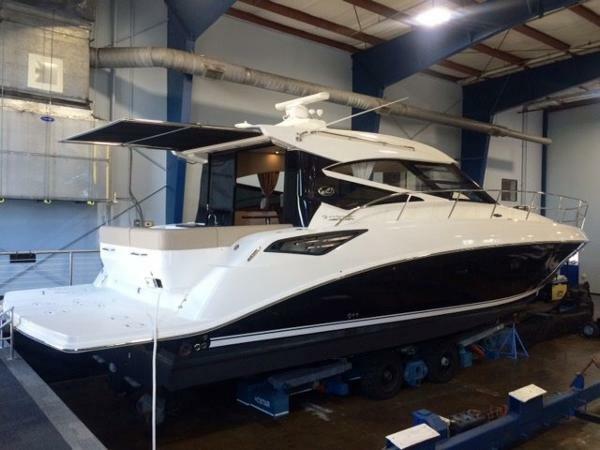 Notable options include:ONLY 250 HOURS on Upgraded Cummins QSB 480 Diesels (459hp) with Zeus joystick pod drives (from standard QSB 425 / 407hp diesels)Generator Upgrade; 13.5kw Onan (from standard 11.5kw)Raymarine electronics package including Radar and dual-screen GPS/Plotter setup.Trac-Vision satellite TVHydraulic swim platformCockpit ACUnderwater lightsTeak cockpit flooringHigh gloss teak cockpit tableBlack hull colorFull canvas enclosure For out-of-town clients, we're guaranteeing this vessel is as nice as represented or we'll cover your travel expenses! This is the one to come see. 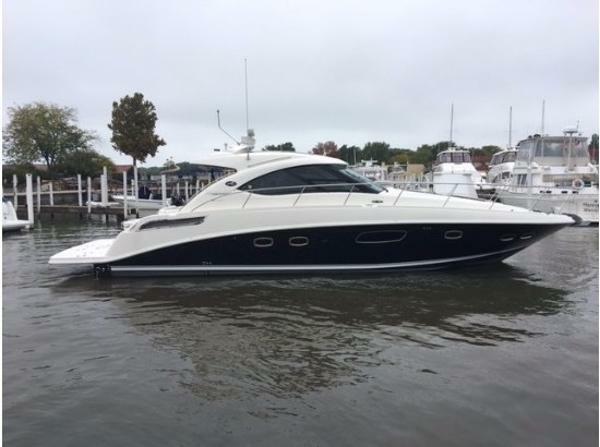 2015 Sea Ray 470 Sundancer An excellent opportunity to own a like new, fresh water only, 2015 Sea Ray 470 Sundancer which is still under warranty. The 470 Sundancer is designed for maximum comfort so a family or even just two couples with you can make their own adventure with all of home's perfect amenities. A generous galley, ample storage and seamless indoor/outdoor entertaining ensure cruising in the 470 Sundancer is always an enjoyable day on the water.Powered by twin Cummins QSB 6.7 480HO diesels with only 91 hours. Also includes Raymarine E165 Chart/Radar with wide auxilliary display, DSS satellite television system, premium audio upgrade, electric retractable cockpit sunshade, wood flooring in sunroom, salon, and galley, central vac system, cockpit grill, underwater transom lighting, windlass and much more. For your personal tour please call or email today. All trades considered. Located in Cincinnati.